"Does body size variation in apex predators mediate prey diversity?" by Sondra L. Burden, Meranda M. Quijas et al. Does body size variation in apex predators mediate prey diversity? Theoretical ecologists have historically treated all members of a species as functionally equivalent when modelling species interactions and their impacts on community composition. Recent studies, however, have found that intraspecific (within-species) variation in ecological function in some species can be equal to or greater than interspecific (among-species) functional variation. Such species are predicted to exert strong community effects, though this prediction has rarely been tested. 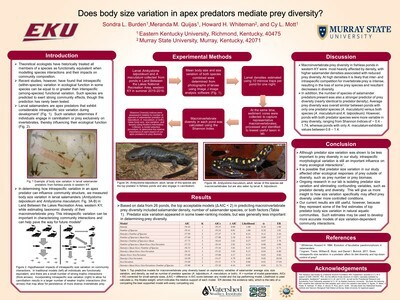 In determining how intraspecific variation in a keystone predator can influence community structure, we measured body size variation in larval mole salamanders (Ambystoma talpoideum and Ambystoma maculatum) in fishless ponds in the Land Between the Lakes Recreation Area, western Kentucky, while estimating taxonomic diversity of their macroinvertebrate prey from sediment cores. Overall, size variation among larval mole salamanders was not a significant indicator of macroinvertebrate prey diversity. However, confounding variables such as predator density likely act together with body size variation in affecting invertebrate diversity, and future analyses will account for these and other factors. Our current results are still useful, however, because they represent some of the first estimates of top predator body size variation, through which more accurate models of size-dependent community interactions may be modelled.